Sunday, September 27 1908 -- Herriman comments on a pair of boxing stories today. First, Jim Barry is apparently considering a fight against Jack Johnson (it would never come off). Second, lightweights Danny Webster and Ad Wolgast are set to meet in the ring next week at Jim Jeffries' Arena in LA. Wolgast would win that night, and had a long boxing career, but his is a very sad story of a punch-drunk fighter who ended up in and out of mental sanitariums. Connie, November 20 1938, courtesy of Cole Johnson. Seems like an obvious obscurity, right? That's what I thought for years. That is, until I did some microfilm research on the Miami Herald. What should I find there but a Larry Wright strip titled Citizen Kane running as late as 1984. Hmm, says I, that seems like an awful long run for such an obscurity. So I expended some further research time, and finally came up with the real explanation. The rarely heard surname of the family in Wright Angles turns out to be ... Kane! So apparently the Miami Herald ran Wright Angles under the title Citizen Kane for some reason. Why? Well, that I still don't know. Maybe the Herald already had a column or other feature called Wright Angles? Why do I tell you all this? I just discovered that although I correctly noted this alternate title for Wright Angles in its listing in my book, I failed to remove the bogus listing for Citizen Kane. So if you have a copy of the book (and if so, bless you!) get out your magic marker and put a big X through listing #1172. Then Kyu! I remember this strip in the Miami Herald. I read it and enjoyed it. Walter Jesse Wellman was born in East Jaffrey, New Hampshire on May 25, 1879, according to his World War II draft card. Descendants of Thomas Wellman of Lynn, Massachusetts (1918) said he was born in Dublin, New Hampshire, which is 8.8 miles / 14.1 kilometers northwest of Jaffrey. In the 1880 U.S. Federal Census, Wellman was the second of two sons born to Frank Pierce, a painter, and Mary Jane. They lived in Jaffrey. Picture Postcards in the United States, 1893–1918 (1976) said Wellman graduated from high school in Winchendon, Massachusetts. The 1900 census recorded Wellman in Boston, Massachusetts at 83 Montgomery Street. He was a student at the Massachusetts Institute of Technology (MIT). 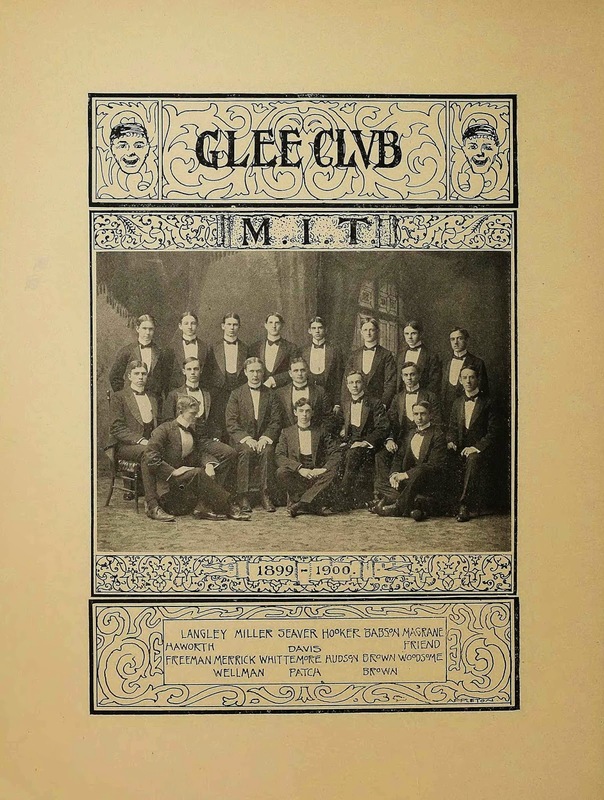 The 1901 Technique, the school yearbook, printed a photograph of Wellman in the Glee Club. In 1902, Wellman graduated from MIT. He was named in the 38th Annual Catalogue 1902–1903. Walter Jesse Wellman. A Non-Terminal Railroad Station. Descendants of Thomas Wellman said Wellman married Matilda Richie in New York City on June 14, 1905. Census records show she was eight years older than Wellman. 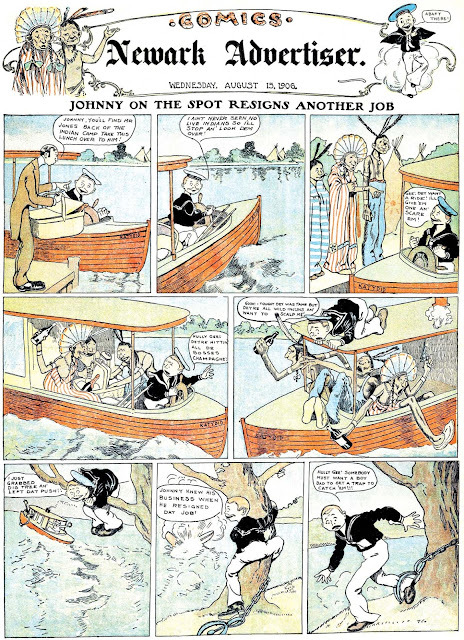 Picture Postcards in the United States said Wellman’s “college calendar designs caught the eye of the editors of the Boston Globe, who commissioned him to do comics and picture puzzles.” After college, Wellman moved to New York City. American Newspaper Comics (2012) said he produced several comics for the New York World. 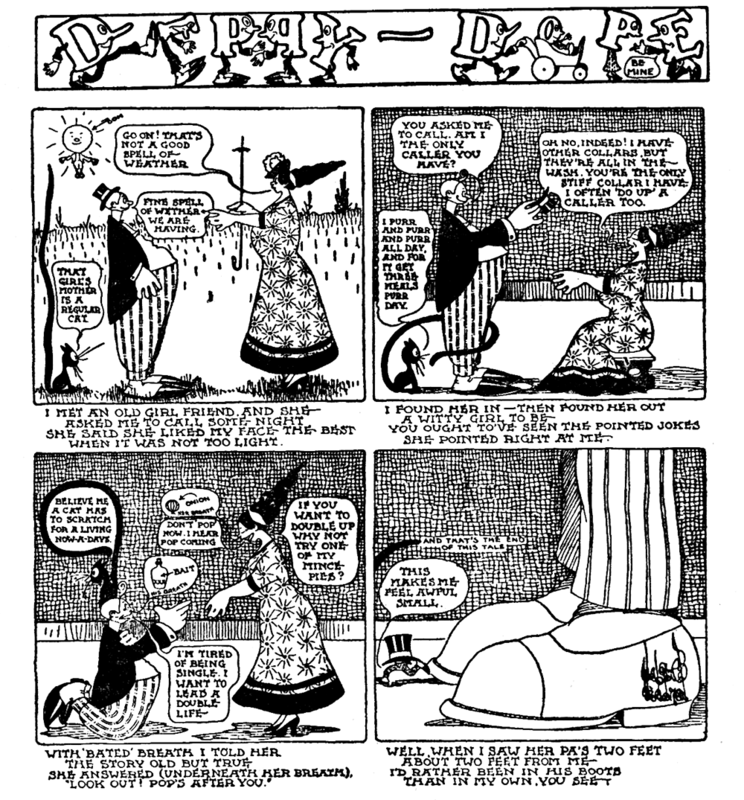 For the Boston Herald, Wellman drew Oh, Where, Oh, Where, Has That Willie Boy Gone?, and If. Little Tommy Tot and Miss Sweetness Yum-Yum was for the Boston Globe. Wellman (Walter), New York, N.Y. The Bookseller, Newsdealer and Stationer, February 1, 1909, reported Wellman’s latest work. 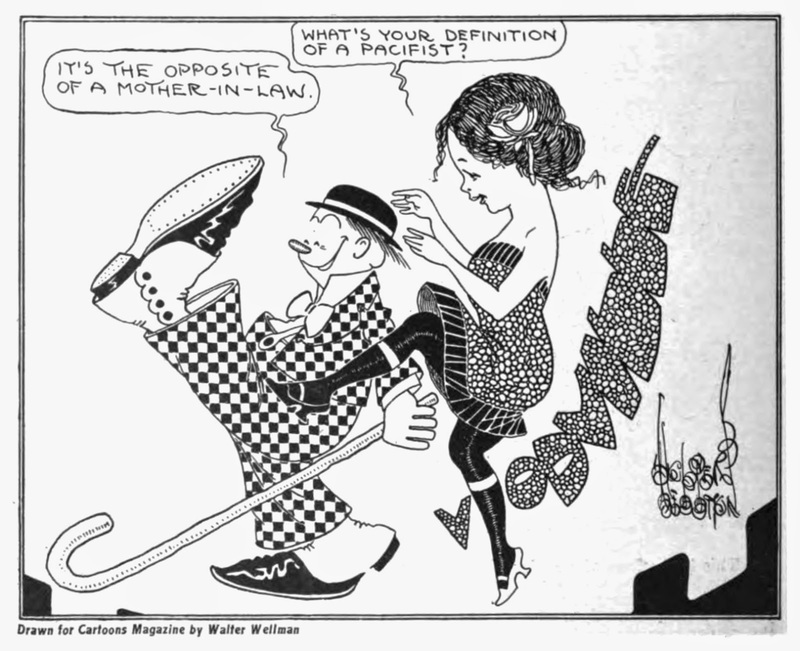 Walter Wellman, the cartoonist postcard publisher, is making a ten-strike with his new series of Woman’s Rights postcards. The Suffragette is pictured in the most humorous way. The original art to one of Wellman’s Suffragette postcards can be viewed at Heritage Auctions. Wellman and Matilda lived at 2125 Amsterdam Avenue in Manhattan, New York City, as recorded in the 1910 census. He was a cartoonist and publisher. Several postcards by Wellman were entered in the Catalogue of Copyright Entries, Part 4, Works of Art, New Series, Volume 5, Numbers 40–43, October 1910. Beauty isn’t all on the surface.—Girl’s a goose to fall in love with a quack doctor.—Here’s to the girl with the hobble skirt.—I haven’t got a million.—I like girls with white faces and green-backs.—I’m saving it all for you.—Just make a noise like a petticoat.—Love will find a way. © Sept. 28, 1910; K 14342–14349. We didn’t do nothin’ but we won’t do it again. © July 8, 1910; 2 c. July 16, 1910; K 11950. 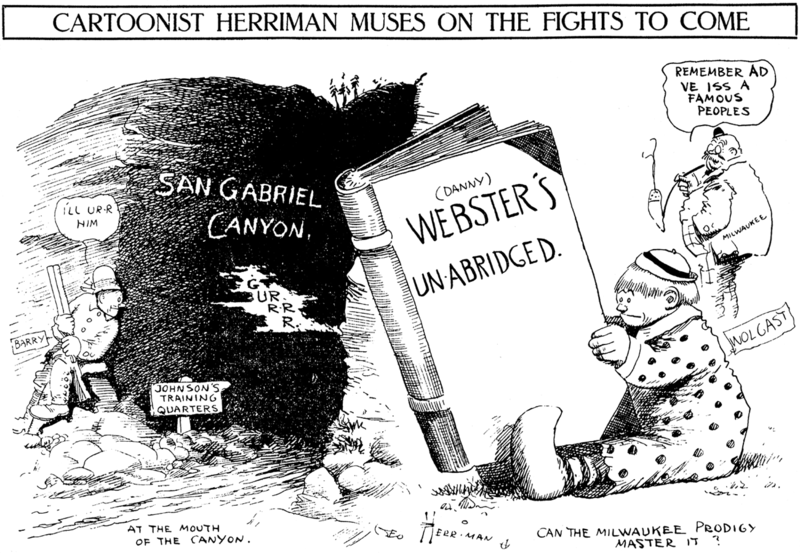 Wellman was a contributor to Motion Picture Magazine (November and December 1916) and Cartoons Magazine (July 1917). Wellman’s article, “Humanizing the House Organ Via the Cartoon”, and cartoon, Raggles the Rover, was published in Postage, April 1918. He also advertised in Postage. Wellman signed his World War I draft card on September 12, 1918. The self-employed cartoonist resided in Montvale, New Jersey. His description was medium height, slender build, blue eyes and light hair color. In the 1920 census Wellman’s name was misspelled as “Welming”. He and his wife lived on Fairview Avenue in Montvale. His occupation was magazine cartoonist. Picture Postcards in the United States said Wellman supplied art to Harper’s Bazar, Life, Judge, Puck, and Woman’s Home Companion. Wellman advertised in The Editor, April 25, 1920. In 1930 the Wellmans remained in Montvale but lived on Hillcrest Avenue. He was a commercial artist. 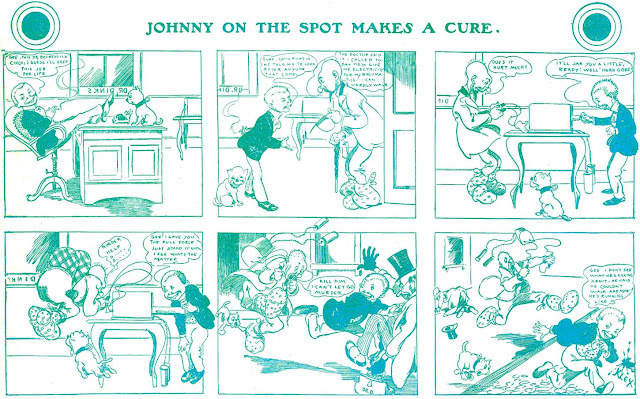 In 1938, Wellman’s puzzles appeared in More Fun Comics. Wellman’s address remained the same in the 1940 census. His occupation was cartoonist. Wellman said he was self-employed when he registered with the draft board on April 25, 1942. The card said he was five feet four-and-a-half inches and 127 pounds. Metropostcard.com said Wellman passed away in 1949 but did not identify the source. It has been way too long since we've seen wacky Walter Wellman on the blog, so let's remedy that with Dippy Dope. 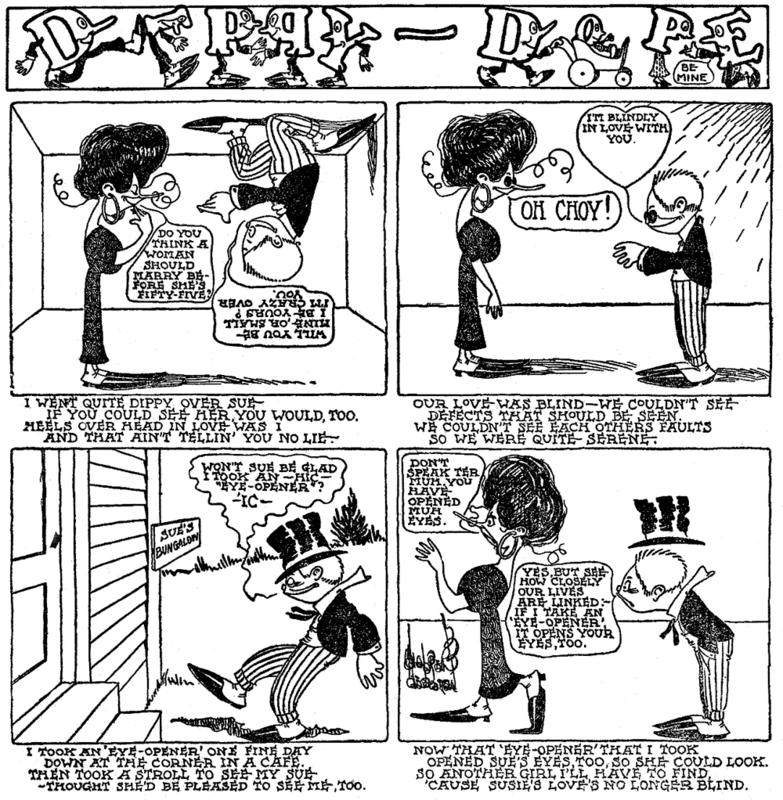 This strip, which had no continuing characters except for the crazy cartoonist who drew it, is a treasure trove of wordplay and breaking of the fourth wall. 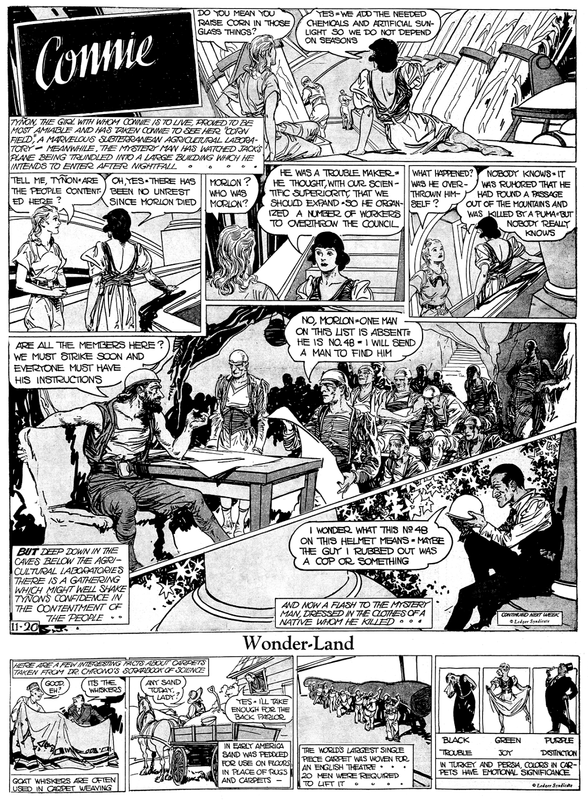 Wellman was having so darn much fun writing this stuff that some of his strips hardly have any room left for the drawings. Well, in Wellman's case maybe that's not the worst fate. Check out some of the great stuff going on here -- characters complaining about the cartoonist, one character smushing a word balloon into the others mouth, a character on the ceiling talking in an upside-down word balloon, and so on. You just don't see this sort of thing in the era of Dippy Dope, which ran from about 1911 to 1913, and was probably distributed by World Color Printing. What a shame that Walter Wellman's work, which was ubiquitous way back then, is utterly forgotten and obscure today. Well, the good news is that Alex Jay has dug up the dirt on this nutball, and we'll learn which insane asylum he lived in tomorrow. Have you ever read Molly and the Bear? It's a terrific comic. You should post about it! Here's one of those strips about a guy who can't seem to hold a job. These were pretty common back in the 1900s, and this one generally runs true to form. There are only two things that make Johnny on the Spot sort of interesting. First, his jobs tend to be more unusual than in the typical strip of this kind. Whereas the typical jobs are waiter, clerk, salesman, etc., Johnny at least doesn't go for the mundane -- above we see him impersonating a doctor, operating a lake boat, and as a dog-catcher. What these strips lack in bust-a-gut humor they more than make up for in historical insight. I especially like that the doctor isn't particularly ridiculed for using electric therapy; the gag is purely based on Johnny not knowing how to properly regulate his quack medical device. The second interesting thing about Johnny on the Spot are the creators. The originator of the series signed himself Kley. Now that immediately sets off alarm bells that it might be Heinrich Kley, the famed illustrator/painter/cartoonist, but wishful thinking aside, there is no way that our Kley is the same guy. 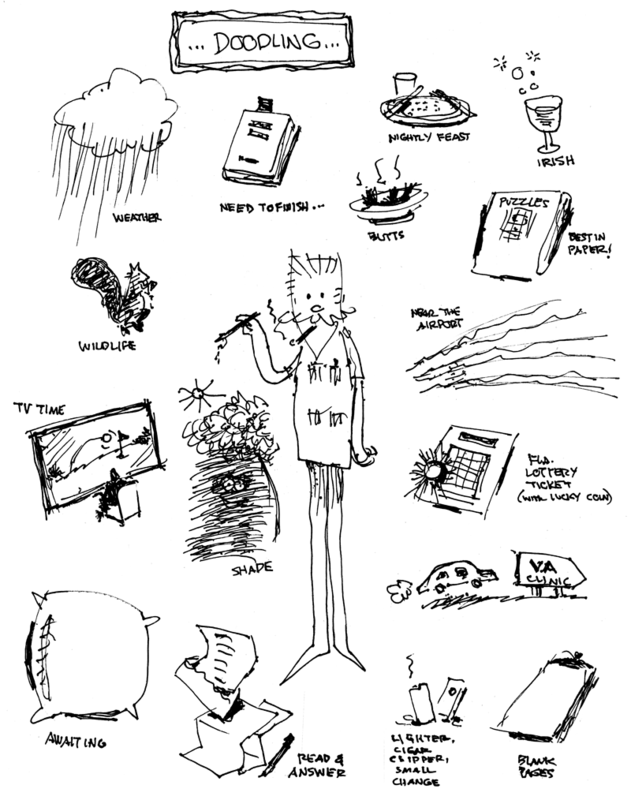 Our Kley's cartooning is rather primitive, nothing like the works of the master (warning: link is NSFW). 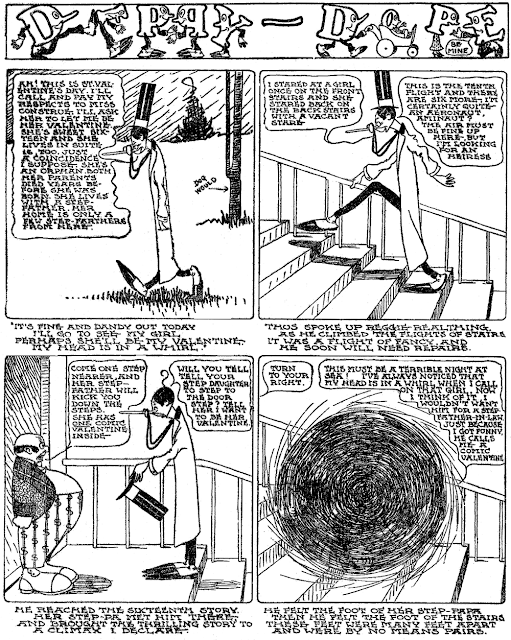 Mr. Kley drew the strip from March 29 to June 7 1903, and was then replaced by Everrett Lowry, who rarely signed the strip for some reason. He might not have signed at first because he was working at the Chicago Chronicle, but that gig ended in short order, and he continued doing Johnny on the Spot mostly incognito until the end of the series, on March 6 1904. 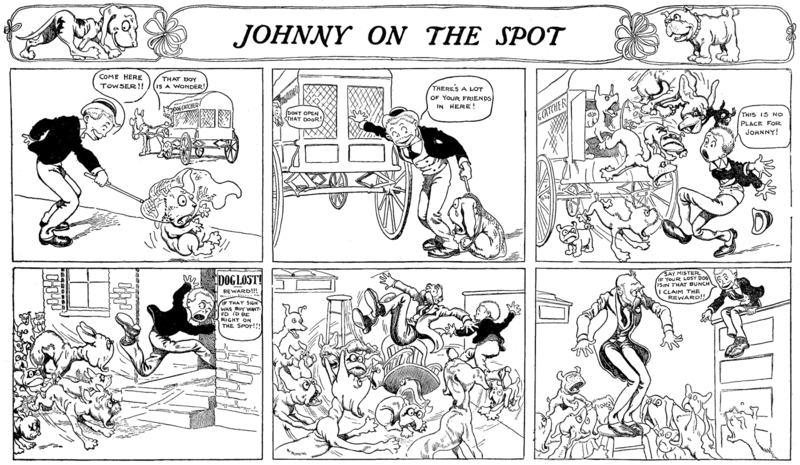 Johnny on the Spot ran in the C.J. 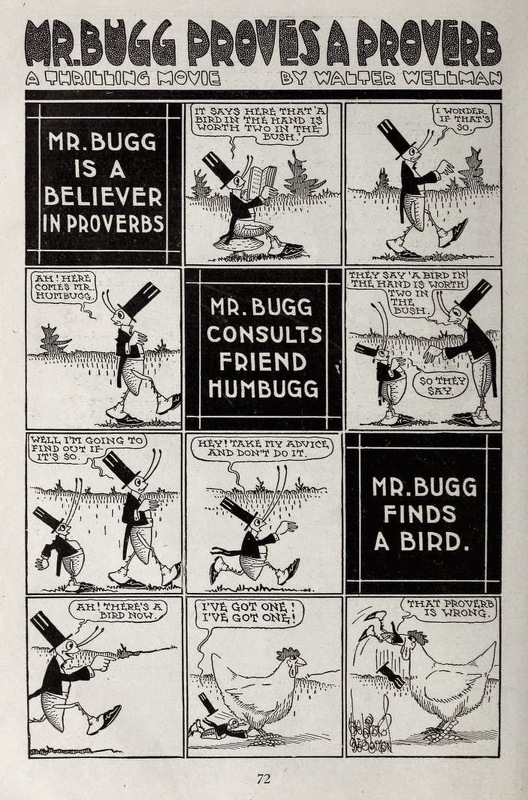 Hirt copyrighted version of the McClure Syndicate Sunday section, and was later reprinted in the McClure sections of 1906. Thanks to the late Cole Johnson, who provided the scans. 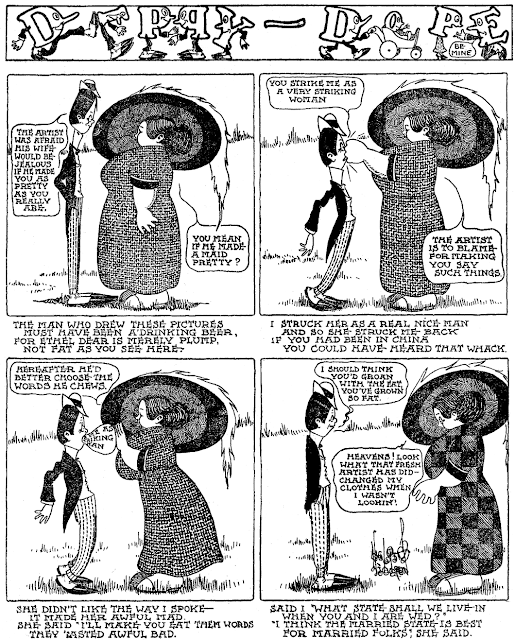 It would seem there's an inconsistant idea of just what a boy hero in a strip could do in Edwardian times, and still have the reader's affection. Somebody like Muggsy could be an all around jerk, but he was always pulling dirty tricks on people we could not sympathize with, like cops, grouchy shopkeepers, or bunco men. I've never seen where we'd be asked to like a dog catcher, seemingly a universal villian in kid's stories. The NEWARK (NJ) ADVERTISER had, in 1906-7 reached a low point after seventy-four years in business, and in desperation for sales had become a lively, pictures-and-fudgepans Hearst-like paper, and even invested in the new exciting sales booster of comics- in their case, two ready-print sections a week, a WCP issue on Saturday and a McClure on Wednesday, like this one. It didn't help, and the Advertiser sunk below the waves in 1907, now totally forgotten. They left behind some funnies for us to gorp at a century later, though. Hi Allen -- I've always wondered-- what is considered to be the first "modern" comic strip post-WWI? Gasoline Alley? Bringing Up Father? Krazy Kat? You have made retirement look like the dream I hope it to be. Hard to believe when I met you I was a teenager and now I just signed my retirement papers (although I won't officially retire for 4 to 5 years). Hope to get over to see you in the next month or so.